With a view to cater the requirements of the patrons in the industry, we are providing an exclusive array of FRP Pyramids to our valuable patrons. 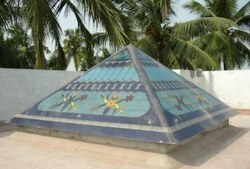 All pyramids are available in various specifications in order to fulfill the diverse demand of the patrons. Our customers can avail these products at market leading price. Our company has sculpted a remarkable place in the market as a reputed manufacturer of Fiber Pyramid. Having a pre-determined quality administration system, we are thoroughly betrothed in delivering FRP Glass Pyramids. 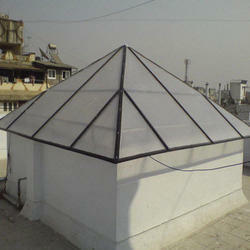 Keeping in mind the architectural requirements of clients, we are engaged in offering a quality range of Pyramid Dome. These are available in normal to spherical surface. Our engineering excellence in building these domes have been widely appreciated by our clients owing to the reliability and qualitative features. - Thickness: 2Mm. 3Mm. 4mm. - Use: For Houses & all types of other constructions.